Bose and JBL are two American companies that are well known in the Bluetooth speaker market, and both of them offer a bunch of high-quality speakers designed for different uses. 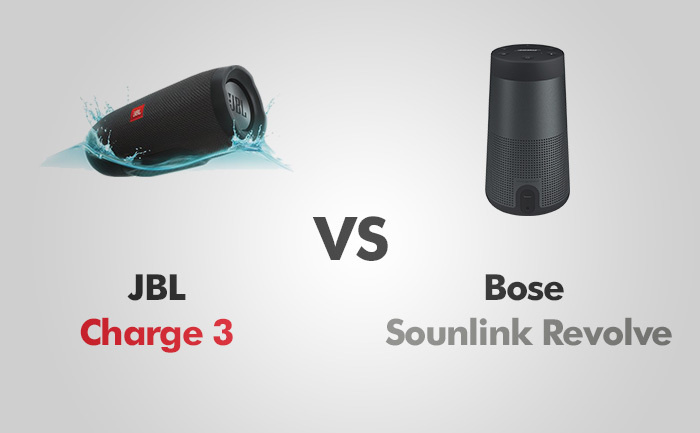 JBL Charge 3 and Bose Revolve are quite different, and in this review, I’ll try to compare these speakers and find out which of them is better. I’ll test build quality, battery life, water resistance and, of course, how good is the sound. Besides that, I’ll try to find out whether there are some features that make these speakers unique. Despite being much cheaper than Revolve, Charge 3 feels like a premium device. Its entire body is a combination of durable fabric and hard rubber, and thanks to its sturdy design, it’s a good candidate for a portable speaker. A 3.5 mm connection if you prefer to connect your speaker to a phone in a wired way. Type-C socket to charge mobile devices. The function of most of them is pretty straightforward. The one that needs a bit of explaining is the JBL Connect button. This button is used to connect multiple JBL speakers. JBL Charge 3 comes in a few different color variations: camouflage, teal, black, blue, grey and red. Bose Revolve offer entirely different design than Charge 3. Instead of a fabric, Bose uses a seamless aluminum body, which comes either black or silver and features rubberized top and bottom. It offers two ports: micro-USB, and 3.5 mm for a wired connection. Bose explained how to use them on their site. In this category, the Charge 3 definitely wins. Bose Revolve offers IPX4 water resistance. It means that it can withstand some rain or accidental splashes. Charge 3, on the other hand, offers a full IPX7 certificate, meaning it can survive 30 minutes underwater at a maximum depth of one meter. Obviously, the medium-sized Bluetooth speaker is not going to compete with bookshelf speakers, but it can play pretty loud. The passive radiators are designed to produce better bass from small drivers. And Charge 3 really sounds larger than it actually is. You can orient it horizontally and vertically, but JBL prefers it to be placed in a landscape mode, otherwise, one of the bass radiators will be blocked and therefore the sound will become distorted. It doesn’t offer a 360-degree sound, so in order to have the best experience, place the speaker with the JBL logo facing your direction. When it comes to mids and highs, they are ok, but sometimes, especially with the high-frequency instruments like violins, treble can be a little weak. Bose Revolve has a big advantage over JBL Charge 3 when it comes to sound. It offers a full 360-degree sound, making it especially useful outdoors. The full-range driver is directed downwards into a diffuser plate, which spread the sound in all directions. And it works really well, especially if you compare it to much cheaper Wonderboom. Bass is also good. Similarly to Charge 3, it offers two passive radiators to fill lower frequencies of the audio spectrum. In order to connect your phone to the speaker, press the Bluetooth button and find the device listed on your smartphone. After that, it will connect automatically each time it’s turned on. You can pair up to three smartphones or tablets. The connection is strong and I can go as far as 60 feet (20 m) before experiencing any problems. Add a wall or two and the connection is still strong to about 30 feet (10 m). You can also connect up to 150 JBL speakers (using the aforementioned JBL Connect+ button) and play them in sync. They don’t have to be the same type of the JBL speakers, just be sure that they use the same technology. Revolve offers the NFC technology. It’s useful for Android users and allows you to connect a smartphone to a speaker effortlessly – just touch the speaker with your phone and both devices are paired instantly. With JBL Connect+ you can connect over 100 speakers, with this one you can connect two and play them in stereo mode. You can pair this speaker with the maximum of 8 devices, which you can cycle through, without the need to go through the pairing procedure each time. This speaker offers a huge 6,000 mAh battery that can last 20 hours – almost twice as long as Revolve. But there is a nice feature that most Bluetooth speakers lack. As the name suggests, the Charge 3 can charge your device. It can be extremely useful if you forget to charge your phone. You can also listen to music while charging your phone. The battery level is indicated by 5 small LED lights on the front of the device. The more lights are lit the more juice you have. This speaker offers just 12 hours, which is not bad, but in comparison to Charge 3, doesn’t look that good. In order to fully charge the empty battery, you need to connect the device for about 4 hours. You can also put the speaker on the cradle, but you have to buy it separately. PROS: Volume level / Battery life / IPX7 waterproof / Power bank / 3.5 mm input / LED indicators. PROS: Great 360-degree sound / Solid sound / Aluminum casing.